Interior designer Mary Douglas’ recent restoration project of a 1920s townhouse is featured in the latest issue of Traditional Home magazine and Top Knobs is part of the classic transformation. Washington D.C. couple Barbara and Bill Sullivan, owners of the stunning townhouse on Embassy Row which Douglas re-decorated, are friends of the designers and knew of her talent and decor style from her flawless track record working with clients. The townhouse was build in 1924 by local architect Robert O. Scholz and the Sullivans wanted the place to have as much of a vintage feel and look as possible. Douglas was able to provide that by reintroducing vintage elements such as historic crown moldings, friezes, paneling and wood trim- all things synonymous with historical beauty. 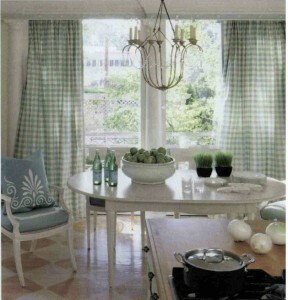 The kitchen includes a silk checkered fabric used for draperies which sets the foundation for the rest of the room’s design. 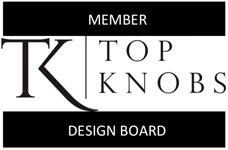 Top Knobs cabinet hardware was used to highlight the beautiful cabinetry. “It has a simplicity and directness to it,” says Barbara Sullivan of her new restored home. “And at the end of the day, that’s what I hope people take away with them when they visit us: that they’ve been to a warm, inviting home that offers up a little bit of s surprise in each and every room.”. The article “Past Perfect” from Traditional Home magazine is written by Brielle M. Ferreira, produced by Jenny Bradley and photographs by Ron Blunt.